The Solomon Schechter School of Queens (SSSQ) provides students with a dynamic learning environment that fosters academic excellence, intellectual curiosity and individual growth. Our administration and faculty work together to instill the SSSQ tenets: (1) learn how to think, (2) discover your sense of self and (3) become a global Jewish citizen. Recognizing that each student is unique and has different strengths and talents, our faculty is dedicated to inspiring all students to work to their greatest potential. Our General and Judaic Studies curricula provide educational opportunities for students to develop their academic skills and to broaden their knowledge in many different areas. 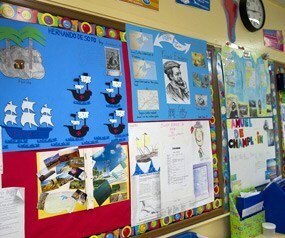 Our student-centered differentiated instructional environment promotes participatory learning and independent thinking. Hands-on and experiential learning activities make each day exciting and offer our students many varied growth opportunities. Our goal is to produce young men and women who possess the skills and knowledge to become successful members of the greater Jewish community and beyond. Our graduates are well prepared and many qualify to enter the “honors tracks” and assume leadership positions in their school communities. SSSQ graduates enjoy a proud legacy.